Quality, Innovation, Peak Performance, and Service. These are the four pillars of Raven's Dimensions of Competition. Not only are they the foundation on which we compete as a business, but they also shape our company culture and daily interactions with one other. One shining example of a team member who embraces these Dimensions is Sonya Vander Wolde, June's Team Member Spotlight winner. According to Debra Dissing, Production Assembler at Raven Aerostar, Sonya actually demonstrates all four of Raven's Dimensions of Competition. The category of Service, however, is where she really shines. 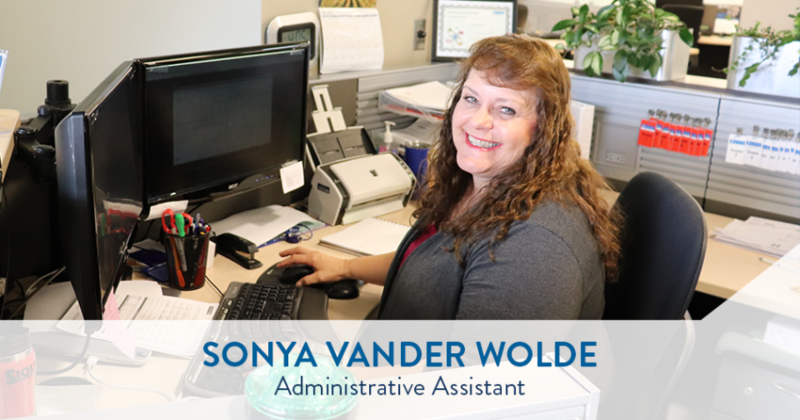 Sonya’s title is Administrative Assistant, but she is willing to help wherever and whenever she is needed. She always has a smile, is in a cheerful mood, and takes time to compliment everyone on a job well done. When the Raven Aerostar team in Madison, SD was very busy and Debra was preparing for vacation, Sonya (who typically works in Sioux Falls) stepped up to travel to Madison and learn Debra’s responsibilities — all while continuing to do as much of her regular duties as possible. Debra added that Sonya is a quick learner and very supportive of how things are accomplished. Every step in the manufacturing process for OTS Dry Undersuits is critical to the full team’s success, and Sonya was able to successfully assist on a variety of sewing and cross sealing jobs. Without her help, we may not have gotten the orders out on time. We all appreciate everything she has done for us and is still doing for us in Sioux Falls. Thank you, Sonya, for your dedication to the company, taking on new challenges, and providing outstanding Service!